Well•Pict Berries proudly announces the opening of its virtual Berry Academy! Designed to inform, educate and excite retailers and their store teams, the Well•Pict Berry Acadamy is literally a crash course on the science and history behind the Well•Pict premium berry brand. Expert tips on grading and handling are featured, helping to get more of the profit-making Well•Pict Berries onto store shelves faster. And attending is easy, because it’s all done online! Together, the video series and Inspection Chart Clipboard will help educate store inspectors on the specifics regarding the unique qualities of Well•Pict Berries, ultimately minimizing waste and increasing profits across the board. 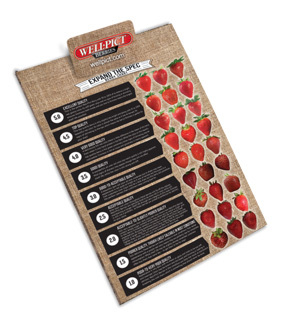 To order your Well•Pict Berry Inspection Chart, please contact julie@wellpict.com. Have you watched the Well•Pict Berry Academy video series? Think you’re an expert on all things Well•Pict? Prove it by taking our short, multiple-choice test! Upon “graduating” from the Well•Pict Berry Academy, you can print out your certificate of completion to hang in your office!